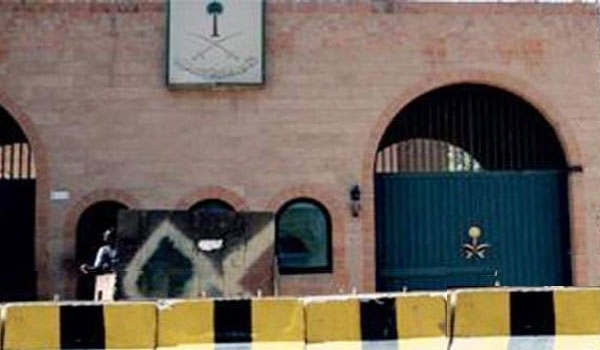 JNN 30 May 2015 Sanaa : The security forces guarding the Saudi mission in Sana’a surrendered the embassy to Ansarullah forces, Yemeni media sources said on Saturday. Yemeni al-Hayad and al-Waqe’ al-Yemeni news websites reported that Ansarullah forces drove all the 40 Saudi embassy guards out of the mission and ordered them to surrender their weapons without any resistance, and they did. The reports said Ansarullah took control of the Saudi embassy in Sana’a in reaction to the Saudis’ continued attacks on residential areas and hospitals alongside army positions in Yemen. Saud fighter jets bombed the Imam Hadi (AS) ancient mosque in Yemen’s Sa’ada governorate. According to al-Mayadeen news network, the mosque was targeted in the early hours of Saturday. Saudi warplanes also bombed the areas of Qamar and Saqayn in the northwestern province. According to Yemen’s al-Masirah TV, four civilians were killed and over 10 others injured during the attacks. Saudi rockets also struck the same areas. Meantime, clashes between the popular Ansarullah and the Saudi-backed loyalists of the fugitive president continue in the Southern parts of the country as Saudi Arabia has been striking Yemen for 66 days now to restore power to fugitive president Mansour Hadi, a close ally of Riyadh. On March 26, Saudi Arabia and some of its Arab allies began to launch deadly air strikes against the Houthi Ansarullah movement in an attempt to restore power to the fugitive former President Abd Rabbuh Mansour Hadi, a close ally of Riyadh. The Saudi-led coalition announced on April 21 that its military operation “Decisive Storm” has ended, but hours later, air strikes and ground fighting resumed. The Saudi-led aggression has so far killed at least 4,132 Yemenis, including hundreds of women and children. This entry was posted in Middle East and tagged Ansarullah, Imam Hadi, Imam Hadi Mosque, Mansour Hadi, Sana'a, Saudi Arabia, Saudi Embassy, Saudi Jets, Yemen. Bookmark the permalink. WELL IF THE SAUDI JEWS WILL NOT BOMB A MOSQUE, WHO WILL? .THAT IS THEIR RESOLVE.